I own more war movies than any other genre. Not that I own very many movies, mind you. I watch most films on Netflix, Amazon, or in the Theater. I also wouldn’t consider war films my favorite kinds of movies either. But there’s something about them that feels important to me. War is one of the worst endeavors humans can undertake. When we make war, we bring hell into broad daylight. However, wars are ideally fought because good men stand up to stop evil ventures. Few wars can be justified as righteous wars. Even fewer have had as clearly good and evil sides as World War II did. There is much to learn from the good and evil that took place during the Second World War. WWII movies make us question how far we would go to preserve freedom. They show us the horror, violence, and cruelty decent and indecent men are capable of. They show us that we have more capacity to forgive and heal than we’d ever think possible. Here are my picks for seven WWII movies you must see. All of these movies have important lessons to teach us, even if those lessons are simply that war is hell. But more than a few also give insight into how beautiful life is, and that there’s good in this world worth fighting for. 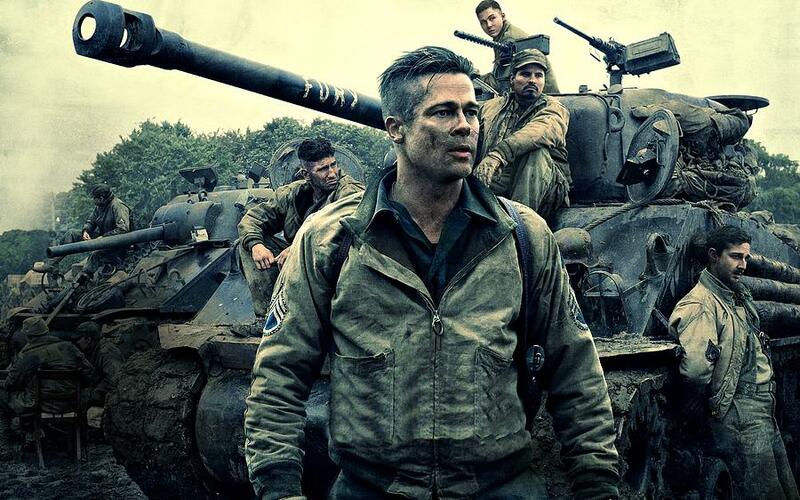 A pulverizing tour de force directed by David Ayer and lead by Brad Pitt, Fury follows a fictional tank crew during the last grueling push into Nazi Germany. Acting and character development are highlights here. 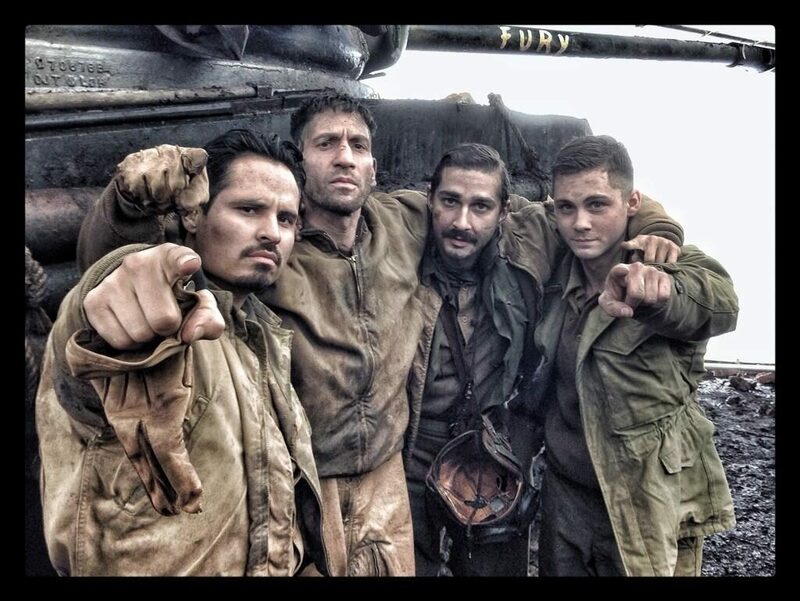 For me, seeing Shia LaBeouf in a serious role was one of the best parts of this movie. Fury at its heart is a gritty story that shows the awfulness of war and the toll it takes on those who fight it. It isn’t the most inspiring or even entertaining movie on our list, but it is defiantly worth seeing. I had a friend pester me about it until I promised him I’d see it and I am happy he did! Unlike the other entries here, Band of Brothers is not a movie but an HBO miniseries produced by Tom Hanks and Steven Spielberg after they made Saving Private Ryan. 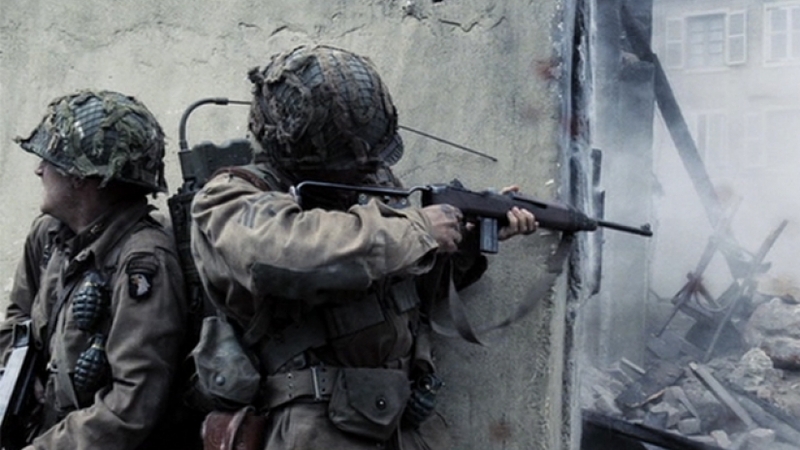 While Saving Private Ryan is fictional, Band of Brothers is composed of true events and characters. Each episode begins with samples of interviews with the real veterans who are portrayed in the show. These veterans also previewed the episodes for accuracy. One of the many true stories on our list, Unbroken tells the story of Louis “Louie” Zamperini (Jack O’Connell). While this Angelina Jolie directed films received mixed reviews from critics, I fondly remember watching it in a packed theater in December and feeling truly touched at the end. Louie Zamperini was an Olympic runner before becoming part of a bomber crew during WWII. During a search and rescue mission, his plane went down in the Pacific ocean, where he and another crew member survived for 47 days in a life raft. After this, they were captured by Japanese soldiers and held as prisoners of war until Japan surrendered. It’s a story of strength, resolve, forgiveness, and redemption. The characters are compelling and well acted. Also, there’s this one scene with a shark that made the movie for me, but I won’t spoil it. 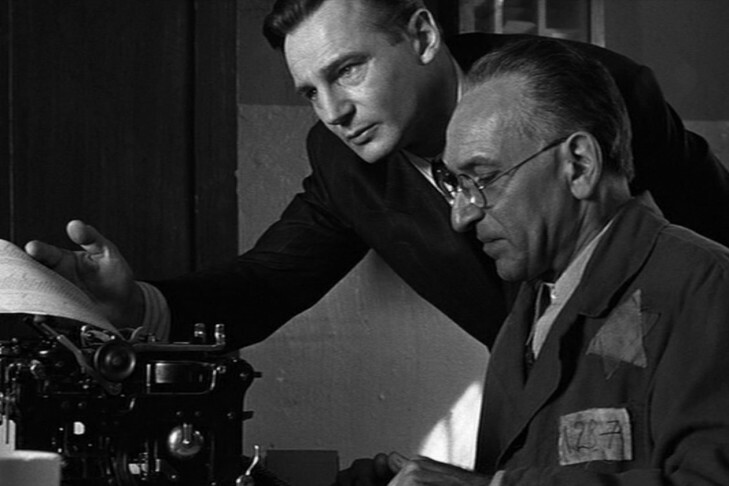 One of the darker movies of our list (which is saying something considering the genre), Schindler’s List dramatizes the true story of Oskar Schindler (Liam Neeson), a German industrialist who saved a great number of Jews from certain death in the Auschwitz concentration camp. Schindler would hire Jews to work in his factories as a source of cheap labor and kept a careful and cordial working relationship with the SS to keep his workers safe. Directed by Steven Spielberg, Schindler’s List was shot in black and white to give it a timeless, documentary-style feel. It is a thought-provoking piece on good and evil, our roles in bringing about good and evil, and the motives behind our actions. It won seven Academy Awards, including best picture. Directed by Mel Gibson, Hacksaw Ridge is a very special and different war film than most that I’ve seen. 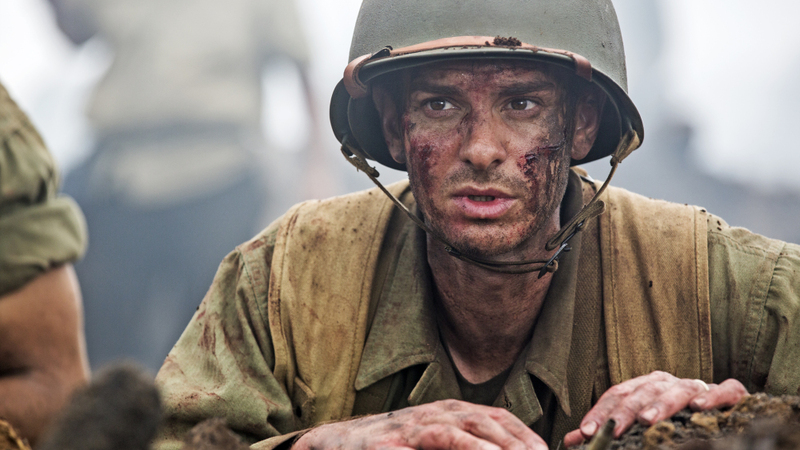 It’s a biographical drama about Desmond Doss (Andrew Garfield), a conscientious objector who went to war as a combat medic and received the Medal of Honor for the lives he rescued. What sets it apart is that Hacksaw Ridge dives deep into horrifyingly realistic depictions of battle while at the same time showing us the best mankind has to offer. The first half of the movie is so sweet, funny, and romantic, you’ll forget it’s a war movie. Then Doss gets to the blasted hell-scape nicknamed Hacksaw Ridge on Okinawa and bullets start ripping people in half. 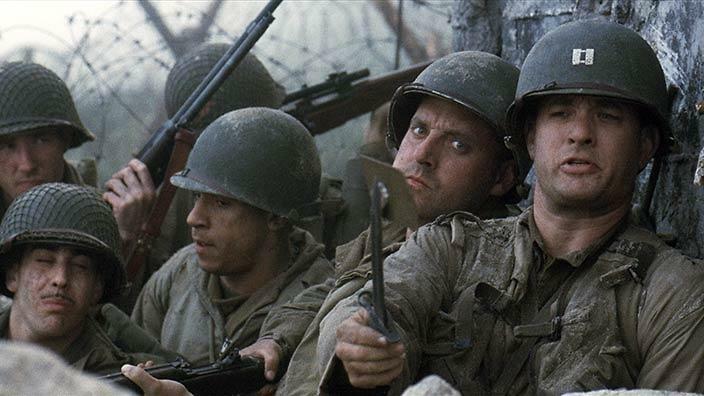 Saving Private Ryan is the only war movie I’ve seen that is on par with Hacksaw Ridge’s gore and savagery. And as the world tears itself apart, Doss does his best at putting small pieces back together. If you aren’t sure which movie to see next on this list, this is my personal favorite! Perhaps the most important movie on this list, Mrs. Miniver won 6 Academy Awards, including Best Picture. Released in 1942, this drama depicted the struggle of a British family coping with the effects of war on the home front. In 2009 it was inducted into the National Film Registry by the Library of Congress and will be preserved for all time. I often find classic movies boring, drawn out, or short on plot. If you’re like me, fret not. This is not that kind of movie. 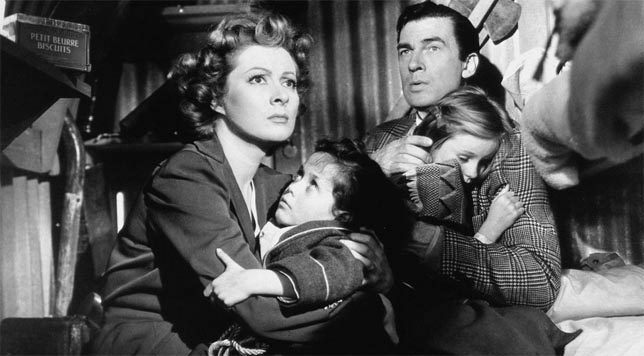 If you are any kind of movie or history buff, or if this blog has held your attention up to this point, you need to see Mrs. Miniver! Also, unlike most entries on our list, the movie is suitable for the whole family. No WWII movie list would be complete without this star-studded masterpiece. I credit Saving Private Ryan to waking me up to how terrible war really is. Very few (if any) movies are as visceral is this one. The violence is detailed and raw in a way that is not stylized or glamorous. I’m not going to give a synopsis of the plot here. If you don’t know what it’s about, go see it. It’s one of Tom Hanks best performances and it’s a paragon of its genre. Instead, I’d like to talk about its importance to history and how that ties into our upcoming documentary. While the phrase “war is hell” is common, seeing the unflinching realism of Steven Spielberg’s take on the D-Day invasion is a sobering experience. Most Americans are woefully ignorant of what happened in Normandy on June 6th, 1944 and I believe if not for Saving Private Ryan, we average citizens would have no idea about D-Day at all. For the people of France, however, this day is something like our Fourth of July. D-Day was the beginning of their liberation from Nazi occupation and saved the French culture and way of life. What about The Girl Who Wore Freedom? To this day, the French are incredibly grateful to the United States for our role in liberating them. There’s an amazing love story happening between our nations that most of us are unaware of. This part of the story isn’t really touched on in Saving Private Ryan or many of the other movies but will be the sole focus of The Girl Who Wore Freedom. Can you help us sprint to release the film this May? Please donate today. The people who have and are working on this documentary are grateful for your support! Nate started making “movies” around age two by drawing pictures and narrating (or semi-intelligibly babbling) the action for his parents. 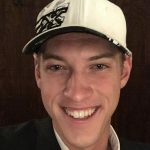 He earned a bachelor’s degree in creative media and film from Northern Arizona University and resides in the mountains of Northern Arizona. Being a self-described “indoorsy-outdoorsman”, he has too many hobbies to keep up with, but currently enjoys making YouTube videos with his younger family members, competing in ranked matches of Ghost Recon Wildlands, playing airsoft, going to metal concerts, and learning new ideas about God and other people. You really are missing a couple greats on this list that are definate includes. One being the 1990s Stalingrad and the other Generation War. Yes, the list is very mainstream. I will have to check those out. Please leave us your own list, if you’d like!